If I'm not eating, I might as well be writing. The very tasty finished product. I’m not sure why this hasn’t already made it to the top of the foodie pyramid, as God knows, there was an entire quarter where I couldn’t attend a dinner party without someone bringing up chocolate covered bacon. 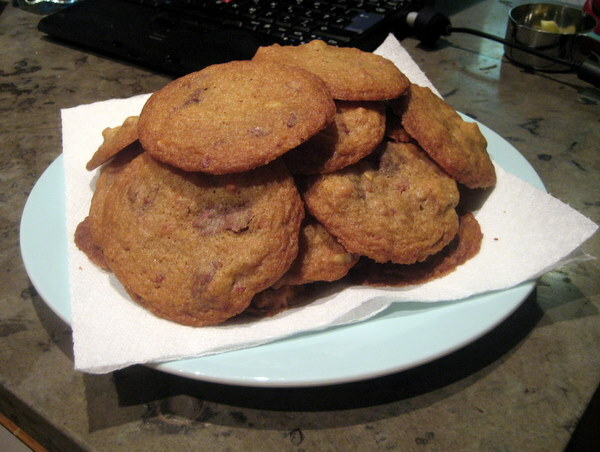 I made these cookies for a dear friend, Oscar, who is a serious baconophile. Given that I was pretty confident that I wasn’t a culinary pioneer with this idea, I asked google for a recipe, and I found one, from an aptly named source: Noble Pig Vineyard & Winery. Their site is well worth a visit, as it’s full of recipes for things I really want to eat… I mean, make! 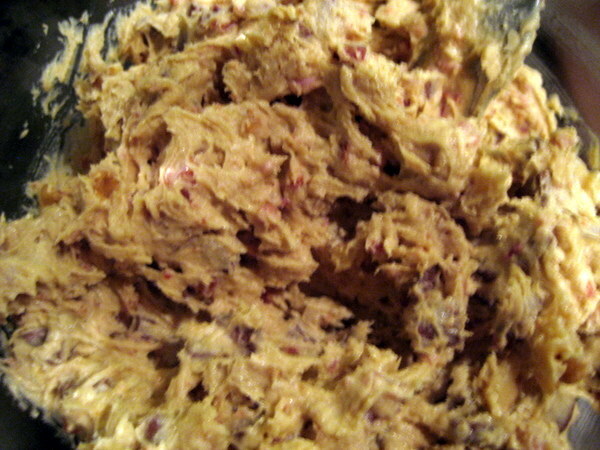 Their recipe is available here, and it comes complete with lots of tasty work in progress pictures. (Yes, you have to look at their site to get the recipe, that’s only fair). Our version required a few modifications. I’ve never seen maple smoked bacon in a UK supermarket. 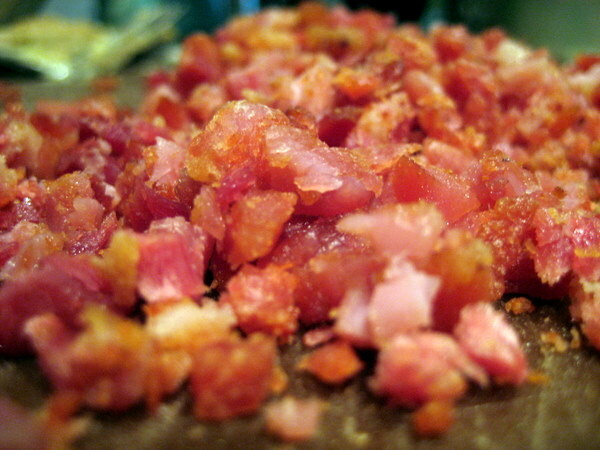 British bacon is different from American bacon in that it comes from the back, rather than the belly. So, we just used British bacon. We also couldn’t find maple extract, so I added a bit of maple syrup! I could eat these all day. If they weren’t a gift, that plate would already be empty. 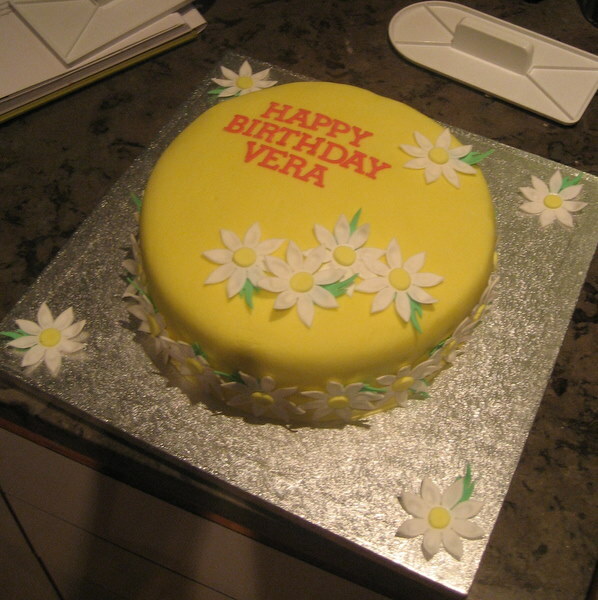 Today is my friend Vera’s birthday, and naturally, I saw this as a fine reason to inflict some cake on her. Honestly, a lot went wrong along the way. I share this primarily to show how serious I am when I say that making a cake look pretty isn’t as hard as one might expect. Mistake #1: I used a cake mix, purchased by my husband in an attempt to save my cake fail-ed Tetris cake project. I decided I might as well use it, rather than throw it out, and rationalized the decision by focusing on all the extra decorating time I’d have. 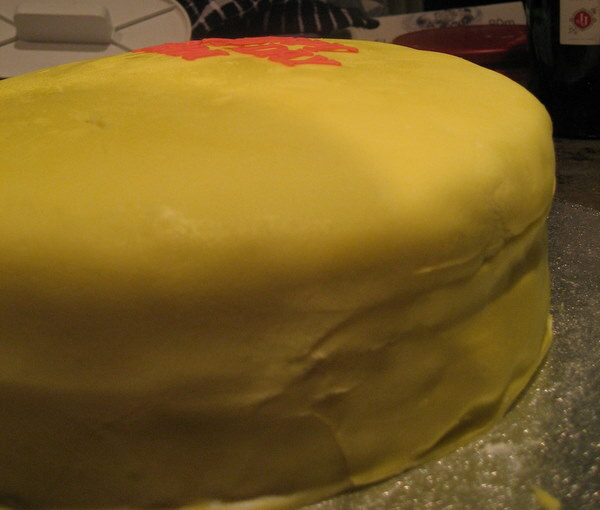 Problem is, it yields a really domed cake, and had I really leveled it, the sponge layers would have been too small. So, I just leveled it a bit and went ahead. This is the critical stage where I should have stopped. Mistake #2: Chock full of denial, I went ahead and iced it, but because the layers were so uneven, there was a pretty big gap between the two sponges. Despite my husband’s assurances that everyone loves icing, I have doubts here. Thing is, I couldn’t pick it apart without just ruining all progress to date. So after a bit of refrigeration, it was sugarpaste time. After coloring it yellow, I rolled it out, and I tried to apply it. The paste broke in two spots, right near the big gap that I had tried to fill with icing. I managed to patch that up well enough that my cake looked like it actually survived a tumble down the stairs. That’s when I remembered something very important- flowers fix everything! Now to serve it and see how much people do like icing. Surely one can’t do better than chocolate butter cream, though! We were invited to a Russian New Year party, and the invite suggested that guests of Russian heritage bring something Russian. We lack Russian heritage, but we decided to bring something reminiscent of a beloved Russian export: Tetris! in cake form! I used my new 10″ square pan and this chocolate cake recipe from BBC Good Food, not only because it not only looked good but it was a good match for the chosen pan. All the comments mentioned how big the finished layer was, and they weren’t kidding. 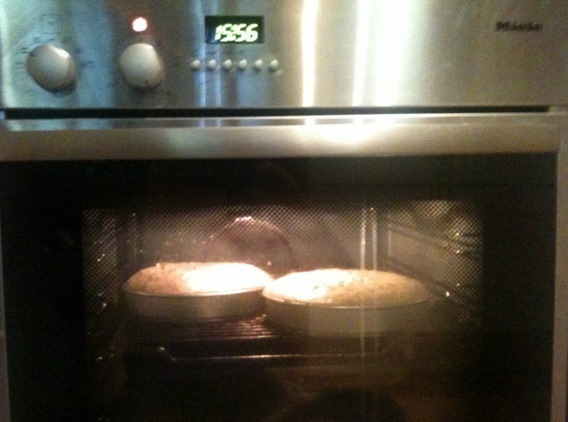 At 1650, The alarm went off for the oven. I thought it was due out at 1730, but I tend to easily lose track, so the timer is much more reliable than I am. I checked that it was done using a cake tester, which came out clean, and removed the cake. After that, I mixed up some chocolate buttercream while waiting for my behemoth cake to cool. Unfortunately, the cake takes an age to cool because it’s so big, and I’m an impatient person, as I tried to take it out of the pan too early and minorly cracked it. oops. As impatience rules supreme, I put it in the fridge to help the cooling process, once the pan was cool enough to handle. Much clock watching followed. It took more than four hours. 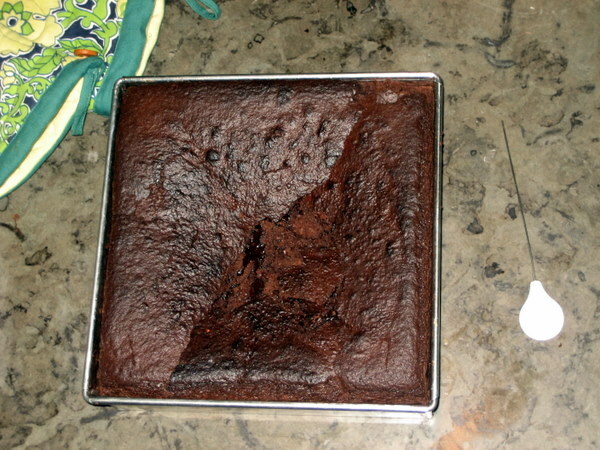 My second attempt to remove it from the pan revealed that the center was a tasty chocolate stew, rather than cake. This is when my husband and I realized that there was a reason why the timer seemingly went off earlier than planned… my dear husband set the timer for 1:50 – 1h 50m, not 150 min. I had removed it from the oven 40 minutes early! Grasping at straws, I crammed it back in the oven and read numerous websites telling me that I should just abandon all hope. I was still optimistic that if I could bake the center, I could just cut off the outside of the cake, eliminating the overbaked bits, and still have enough to cover in fondant and decorate. 60 minutes later, it seemed more done with a few checks, yet picking at it revealed a smallish spot that still was very underdone. It seems you really can’t salvage an underdone cake. Cake Fail! 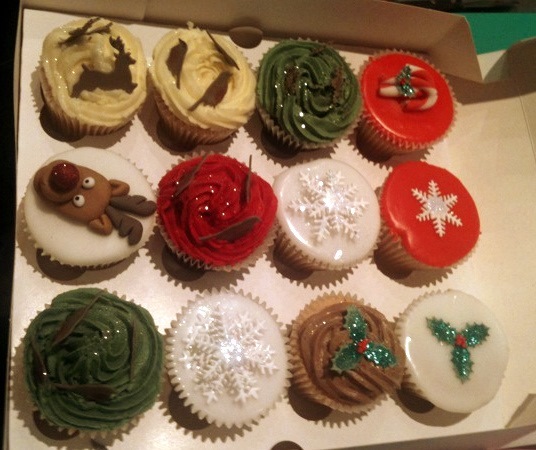 Getting festive, cupcakes were made. Yay Christmas! 1. Edible Glitter fixes everything. It makes everything a bit more pretty. I also learned that just because edible glitter is edible, doesn’t mean it’s digestible. 2. 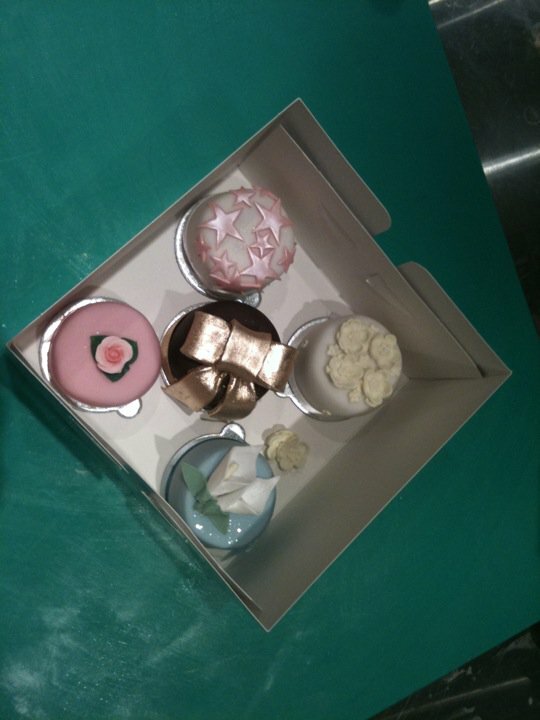 Using liquid fondant is much easier then I expected, but you have to work quite quickly as it hardens within minutes. I think the hardest part is not overcooking it and making it into a rock. 3. Piping icing is much easier if you aim at 90 degrees. Doing it on a slant results in offroad icing. 4. When filling the cupcake wrappers/ tins, less is more, as if you overfill, whatever you put on top won’t have the wrapper to help it along. 5. If you want the cupcakes to come out flattish on top, use margarine. Butter will yield a dome-shaped top, which you’d have to then level. 6. I can eat two of these before feeling vile. In preparation for our annual mulled wine bonanza, I decided to put my new cake decorating know-how to work, mostly to see if I could reproduce what had come so easily in the classroom. For starters, I actually had to bake my own cake. A quick google led me to Mark Sanford’s How to Make Cakes blog, and more importantly, his recipe for Victoria Sponge cake. After making the sponges on Sunday, I allowed them to cool before mummifying them in cling film and popping them into the freezer. I did this because I wouldn’t need the sponge for another 6 days, and also because I was advised that it’s much easier to apply buttercream to frozen sponge because it is less crumbly. I thawed out the sponge a bit, and leveled it, using a cake leveler to make each sponge perfectly flat – cakes rise, so baking a flat cake is pretty impossible. This gadget is much easier to use than I expected. Next up, the filling. I put a thin later of buttercream on top of one of the sponges, followed by a thin layer of raspberry jam, before stacking the second sponge on top. All stacked, it was time for my least favorite part, applying a thin later of buttercream to the outside of the cake. The buttercream isn’t applied just for tasty reasons, it actually serves to stabilize the cake. Applying it is difficult because the cake crumbles, and one must be careful to not use too much buttercream, as otherwise, the fondant layer will slide off. It seems that the key here is to just heap this viscous goo on and then scrape off the excess with a hot knife. Buttercream applied, I put the cake in progress back in the fridge, in preparation for fondant time. Nonstick mat and roller really are that necessary, unless you like crying. You’ve really got to knead this stuff until it feels like chewing gum. The spacers allow you easily to roll the fondant so it’s perfectly even. If the fondant isn’t of uniform thickness, the cake will look crooked. You have to be speedy, else the fondant will crack and you’ll have to knead it again. Admittedly, I took the easy route and used Dr. Oetker’s Ready to Roll, rather than making my own. I found the Dr. O’s super sticky, and I had to add a lot of icing sugar to it to stop it from adhering to the nonstick mat. In the end, it worked just fine. Now, Once the fondant is all rolled out, you pick it up by rolling and draping it it around the pin and unfurling it over the cake with the bottom side, i.e. most likely the flawless side facing up. Once the fondant is in place, you can remove the excess with a knife. On to the more creative bit… what to put on top. I decided to keep this simple, as it’s the first time I’ve done a normal sized cake (8″ diameter). 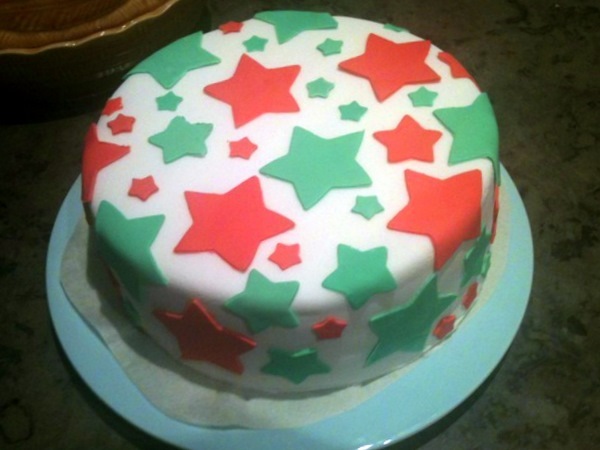 To make stars for the top, I used florists paste, which much like the fondant, requires a fair bit of kneading before you can really mold with it. Florists paste is much firmer than the fondant, and it is typically used for making flowers and other small decorations. After rolling out the paste, I cut lots and lots and lots of stars of varying sizes, and glued them to the fondant surface of the cake using edible glue. After that, there’s nothing to do but clean up the mess and eat the cake, the latter we’ll do tomorrow. As a part of my efforts to appreciate my new free time, I signed up for a few baking courses. I had my first one, “Mini Iced Cakes” today at Cakes 4 Fun, and it lived it up its name. I had a blast. Our instructor, Rachel, was lovely, and our small class of seven students proved to be a fun group. In the course, we learned how to level, shape, fill, and ice our cakes, plus how to roll fondant icing, sculpt flowers and bows, and other fun decorative stuff. One thing was very clear at the end of the day… decorating cake is far more fun than my old day job. I wish I were eating right now.